Superstitions have become more common over time in the sports world. Athletes are performing superstitions to bring good luck and prevent the bad. Some are normal and some are weird, but it’s all done in love for the game. Here are a few examples of famous coaches and athletes with superstitions. Jason Giambi and his teammates wear a gold thong to bust out of slumps. They believe that feeling uncomfortable at the plate due to the thong will get them to stop overthinking in the batters box. Jason Terry wears the shorts of his opponents on nights before games. Moises Alou peed on his own hands to harden them. Athletes at Eastfield even have superstitions of their own. Shooting guard Edward Williams wakes up early on game day to watch his favorite players highlights and also likes to eat pepperoni pizza lean pockets. The soccer team prays as a team before every game. Sophomore Miriam Mendoza leads the prayer as they stand in a circle. The team started praying together at the beginning of the season and it stuck. 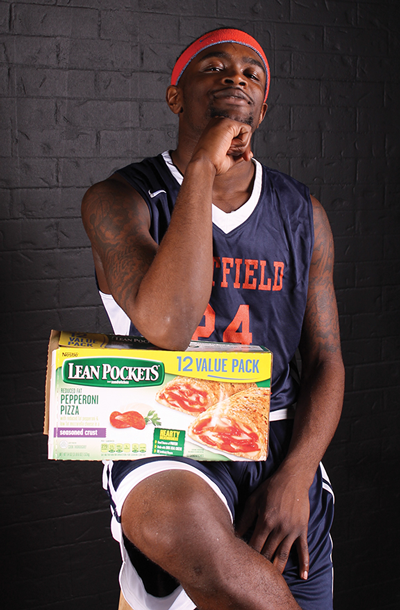 Shooting Gaurd Edward Williams enjoys eating pepperoni pizza Lean Pockets on game days. Pitcher Brandon Saddler eats mac and cheese on game days as well as wearing white Hanes low-cut ankle socks. Infielder Trey Stone eats Panda Express before every game. He gets a panda bowl with orange chicken and white rice. He started doing it in high school at Poteet when the team went to the state tournament. Pitcher Lucas Sullivan wear his Derek Jeter socks every game. Sullivan received his socks at Christmas his freshman year at Eastfield and has worn them every game since. Eastfield baseball coaches Michael Martin and Travis Graves listen to the baseball Gods. The Baseball Gods are a set of God’s in the heavens that determine the outcome of a game and whether the game is even played. Coach Graves and Coach Martin say that the baseball God’s don’t like when players throw their equipment. The God’s also don’t like when you step on the white line. Setter Zelda Ortiz bounces the ball five times before serving. Ortiz also has to have her rubber bands on her shoes. Libero McKayla Petters creates has a new hairdo after every loss.Petters will wears her hair the same way for each game until a loss.